Do you want to know how to get to the cheongdam (station)? There are many ways you can get to cheongdam (station) such as public transportation (bus, subway / metro), taxi and Blacklink limo/transfer/shuttle service. Don't sweat outside waiting for other transportation with your luggage. Make a round trip reservation with Blacklink as you plan for your trip. It is easy, convenient and available 24/7. Then, the assigned Blacklink driver will greet you at the arrival and will drive you to the cheongdam (station). You can use Blacklink for not only hotel but also Gimpo Airport (GMP), Myeongdong, Jongno-gu, guesthouse, resort, airbnb, lodging and anywhere you want to go in Korea. Check out Blacklink customer review posted below. Cheongdam-dong is a ward of Gangnam District in Seoul, South Korea. The area epitomizes the wealthy lifestyle of Koreans, especially for young professionals who have studied overseas. It is known as an upmarket shopping area, with the main shopping street dubbed 'Cheongdam Fashion Street'. Along with Apgujeong’s Rodeo Street in Apgujeong-dong and Garosu-gil in Sinsa-dong, which are connected by the main Apgujeong-ro, they are seen as fashionable and trendsetting destinations. The area is the location for the headquarters of K-pop management companies S.M. 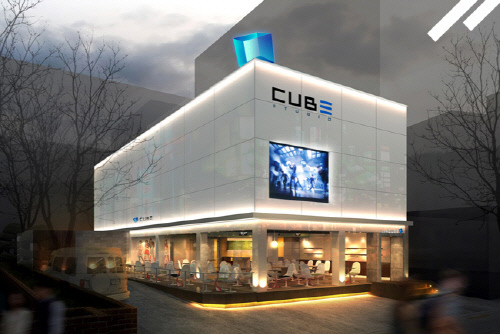 Entertainment, JYP Entertainment, Cube Entertainment, and J. Tune Entertainment,. Since January 2012, the area is also home to FNC Entertainment, who moved into their own company offices, separate from their parent company in Mnet Media Building in neighbouring Apgujeong-dong. The MCM Haus flagship store is also located in the area. One half of the multi-colour facade is designed by British artist Richard Woods, while the other half of the exterior is decorated with individually numbered brass plates. It also has an Italian restaurant in the basement, furnished with Woods' designs. Shopping and dining complex 10 Corso Como, opened in 2008, opposite the Galleria Department Store. 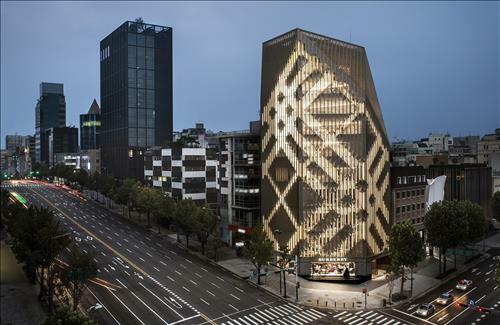 Also in September 2008, French jeweler Cartier opened its first flagship store in South Korea, named Cartier Maison, located on Apgujeong-ro, with its facade inspired by Korean Bojagi wrapping cloth. Helmed by Managing Director Philippe Galtie, he said It is the largest in Korea and at the time of opening it was the seventh largest in the world. In June 2012, luxury bridal gown designer Vera Wang opened her third global and first Asian flagship store 'Vera Wang Bridal Korea', helmed by President Jung Mi-ri, in Cheongdam-dong.